Premium quality tape. Self-adhesive vinyl applies quickly to most surfaces. Comes in the standard one color or hazard which uses two colors striped and is 5-mil thick. 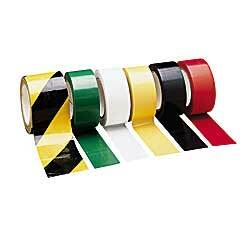 SPECIFY COLOR FOR STANDARD VINYL TAPE: BK - Black, GN - Green, RD - Red, WH - White, YL - Yellow. IN STOCK. For flat surfaces, floor, etc. for extended life. NOTE: specific carton quantities in chart. Only sold in quantities indicated in chart.